HomeLatest NewsLatest NewsAberavon AM welcomes Minister for Economy, Science and Transport to discuss Steel. Aberavon AM welcomes Minister for Economy, Science and Transport to discuss Steel. David Rees AM for Aberavon this week welcomed the Minister for Economy, Science and Transport, Edwina Hart to Aberavon to meet with Trade Union representatives at Port Talbot Steel Works to discuss the issues surrounding Steel Production in Wales, with specific consideration for the Port Talbot site. This meeting provided the unions with the opportunity to bring their concerns directly to the Minister about the future of the plant and the importing of steel from China on the global demand for steel. Following this successful meeting, on Tuesday Mr Rees asked for a discussion on Steel in the Assembly as a chance to see where we are going with manufacturing and the Steel industry here in Wales. Mr Rees was pleased to hear in the response to his request for a debate on steel that the Minister for Economy, Science and Transport has been invited to attend the Steel Summit being held in Rotherham at the end of this week and looks forward to hearing in a future government Statement what actions can be given to support the steel industry. 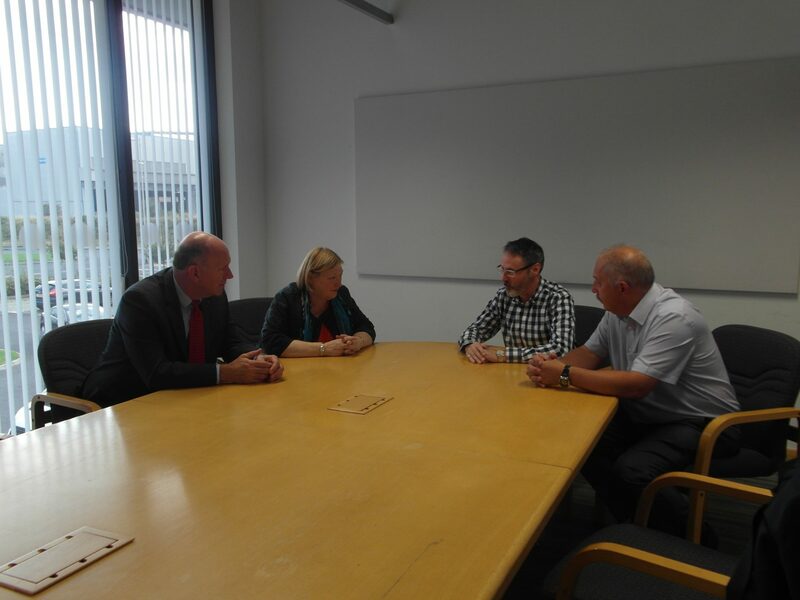 Pictured are Alan Coombs Chair of the Multi Union Committee and Terry Godfrey member of the Multi Union Committee, along with Edwina Hart, Minister for Economy, Science and Transport and David Rees AM for Aberavon.